Your Vinyl Gazebo will always look new and is virtually maintenance free! They make the perfect centerpiece to make your special events even more memorable. Photographers will love the setting for special occasions and photo sets as well. As you browse our collection of gazebos, you will see that our options, customization’s, and details are our specialty. 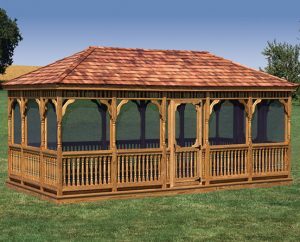 Our selection provide gazebos great for weddings, backyard retreats, hot tub enclosures, spas, decks, and more.